Here is a video that will either get your blood pumping for some MMA action, or totally disgust you in every way. For me, I don’t have context for the situation because no one can hear a thing being said…But we sure can see a whole lot of what’s going down. 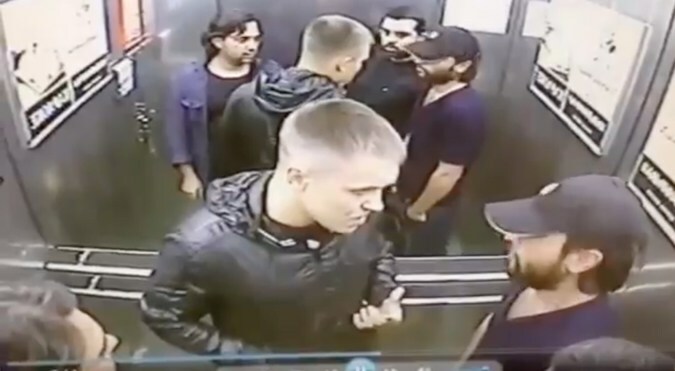 In this video, we have 4 men in total placed in an elevator. We can see them from the security camera that has everything under surveillance. Out of all the guys accounted for, we see one guy who is white, in a heated argument with another one of the 3 in the elevator – all of whom look as if they are from the Middle East, or southern Asia. Whatever their ethnicity, it is horribly irrelevant to what’s about to take place in just a few moments. OUCH! Can you believe that? That was a 1 on 3 brawl right there and the 1 viciously came out on top. It wasn’t even close. You see the guy leave the elevator, making you think that the argument or quarrel was done – nope. He turned and went back in the elevator, swinging a fist and knocking the man on the left right down. He then quickly, and I mean QUICKLY, turns and starts up a fury of punches, taking down the rest of the guys in the elevator. Now this was just pure magic and we don’t know if this guy was attacking to prevent being followed and jumped himself, or if he was in the wrong. But we do know that another story ended quite differently. This story happened in a Brooklyn eatery, where a man who offered to pay for two guys’ meals that had come up short – had instead become the victim of a horrible beating and robbery. The man was only 37 years-old, but the story details that he also had use of a cane. The victim claimed that everything went downhill fast when he did what he thought was a nice gesture – offer to pay for it, since they were short. Just as he offered, the two men became angry and started to beat on the man, taking his cane. As they were doing that, two more scumbags came in from outside and also helped beat the poor man. They soon stopped and all of them left, except another guy who walked in, went through the bleeding and broken pockets of the man, then walked out. It is so unbelievable, but true. I like to think generally people are good…but sometimes, the few that are bad, really make up their numbers with just how vile they are.